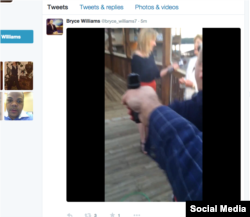 FILE - Ex-TV reporter Vester Flanagan shot former co-workers Alison Parker and Adam Ward while live-tweeting the experience and recording a video he then shared on Facebook. The man alleged to have fatally shot to two U.S. television journalists during a live broadcast Wednesday sent a 23-page manifesto to a national news network in which he called himself "a human powder keg." Vester Flanagan, a former employee of the Virginia television station WDBJ, where the slain man and woman worked, shot himself when confronted by police on a highway near Washington, D.C. He died hours later at a local hospital, authorities said. WDBJ held a moment of silence Thursday in remembrance of the victims in its first morning broadcast since the shooting. The station's website also displayed a large black banner memorializing the victims, 24-year-old reporter Alison Parker and 27-year-old cameraman Adam Ward. The station's morning anchorwoman said at the start of the broadcast, "We come to you with heavy hearts. Two of our own were shot during a live shot [report] yesterday morning." She said the station has seen an outpouring of support in the wake of the shootings. The gunman opened fire Wednesday on Parker and Ward as they interviewed a local business leader at Smith Mountain Lake, near Roanoke, about 375 kilometers southwest of Washington. The manifesto Flanagan sent to ABC News detailed his allegations that he had been discriminated against because he was homosexual and African American. WDBJ-TV website screenshot showing photos of murdered journalists Alison Parker and Adam Ward, Aug. 26, 2015. The 41-year-old had been fired from WDBJ television in 2013 and subsequently filed a lawsuit alleging discrimination. Court documents from that suit revealed the station had taken disciplinary action against Flanagan for months, met with him many times about angry behavior and told him to seek counseling. He also had been fired from a Florida television station in 2000 after complaints about his behavior. In his manifesto, Flanagan described the June mass shooting at an African American church in Charleston, South Carolina, as the "tipping point" for his own behavior. "...I’ve been a human powder keg for a while…just waiting to go BOOM!!!!" the manifesto said. Alleged screen grab of shooting. Flanagan also was known professionally as Bryce Williams. Two social media accounts under that alias were used to publicize images of the shooting. Among them, a video from the shooter's point of view showed him walking up to the unsuspecting news crew, raising a gun at Parker and firing several shots. She stumbles away before the screen goes dark, followed by the sound of several more gunshots. At the time of the attack, the WDBJ TV crew was interviewing Vicki Gardner, the head of the community's chamber of commerce, for a business story. Gardner was shot in the back but survived. An executive at WDBJ said the journalists were working on a routine interview when the gunman walked up. A presenter at the station told viewers, "They were out covering a feature story. They were not out covering protests or demonstrations." The shooting began at about 6:45 a.m. local time (1045 UTC) during a live broadcast. Ward was able to briefly capture an image of the shooter before he and the camera fell to the ground. U.S. President Barack Obama described the shooting as heartbreaking. "What we know is that the number of people who die from gun-related incidents around this country dwarfs any deaths that happen through terrorism,'' he said.